This week I am excited for A Blade So Black by L.L. McKinney! I will read pretty much anything that is any sort of Alice in Wonderland retelling. 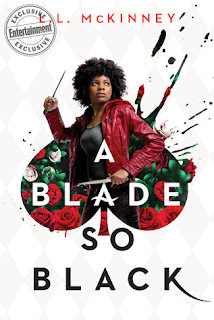 I've been wanting more paranormal books, and A Blade So Black is exactly what I'm looking for. It takes place partially in an evil version of Wonderland and partially in Atlanta. I don't know much about the book beyond the Goodreads description, so I'm going to be going in with an open mind. All in all, I am super excited and can't wait to read this!